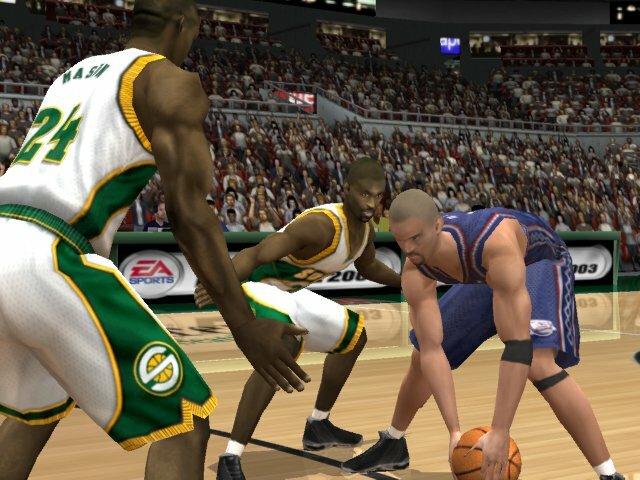 NBA Live 2003 is all about basketball, which means it\'s very fast paced. You\'ll find yourself sinking the 3 pointer, slam dunking with power, and faking people out of their shorts with slick dribbling moves. NBA Live lets you do lots of cool stuff. First there is the option of creating players. I did this a lot. You choose how good your player is, and then you choose how you want him to look. You get to pick out how his face looks, his facial features, if he wears glasses or not, all the way down to his shoes. The franchise option is very cool. The idea is to get your team into the playoffs; from there you try to make it to the NBA Finals. When you finish each season you can sign free agents, trade players, and pick up rookies. This part is a load of fun. Playoff mode lets you go right into a playoff tournament. The one-on-one feature is awesome. You can play one-on-one with any player in the NBA and the old superstars, such as Larry Bird or Dr. J. The graphics are good. The players and coaches look great. I thought the nets on the hoops looked kind of strange, though. Live\'s option of using the analog stick is great. It lets you pull off sweet dribbling moves that fake people out letting you in for an easy score. It can also separate you from your opponent for a clear shot. The only other option worth mentioning is the alley oop button, which lets you give the alley oop. This is a cool move that completes the break away. Nothing I could see here that\'s inappropriate; though sometimes on one-on-one mode the other player trash talks. No swear words or anything like that, but if you miss he\'ll say, \'What was that?\' or \'Come on, man!\' and things like that.